Cliff Deveraux's steam engine...The Waupaca Eastern. Cars that were scratch built by Cliff Deveraux..
Cliff Deveraux at age 81; stick built ore dock with wooden orange crates cut up on a Dremel table saw, which is on the Lind Center and Southern MRR. 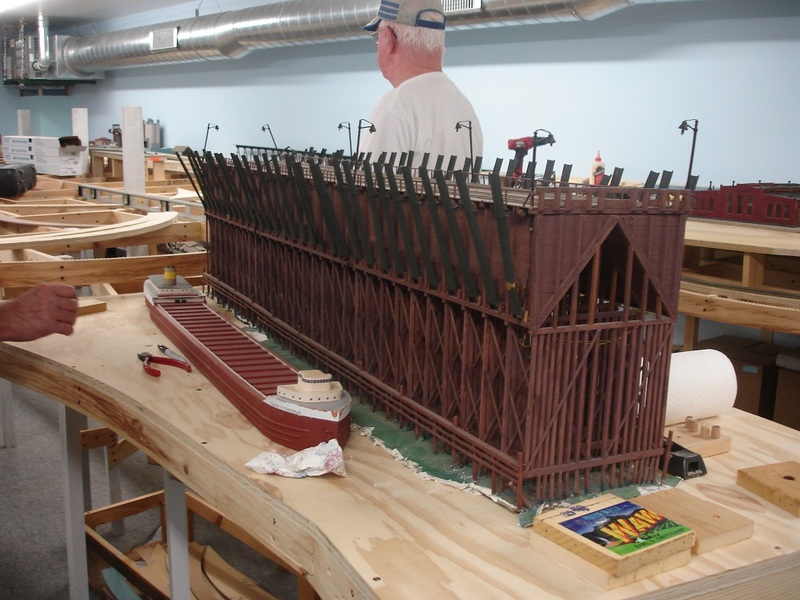 Ore dock that was built by Cliff Deveraux, now on Willard Wilde's layout, the Lind Center and Southern MRR. Ore dock that was built by Cliff Deveraux, now on Willard Wilde's layout. 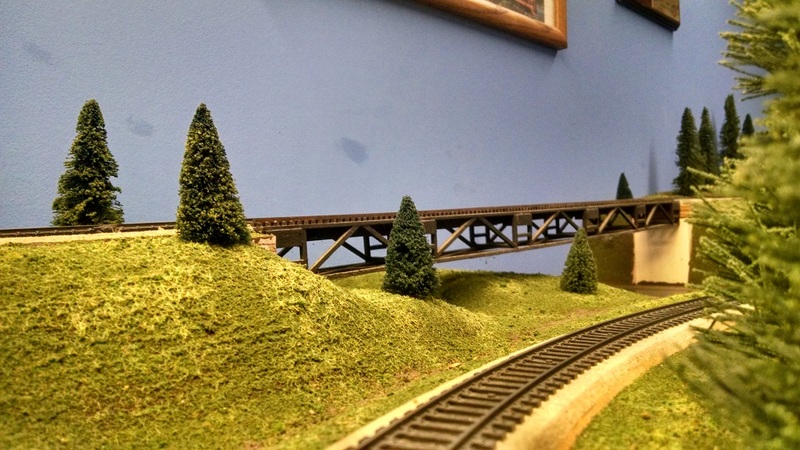 Bridge scratch built by Cliff Deveraux on Roger Hildebrandt's Evergreen Hills and Allen Creek Railroad. 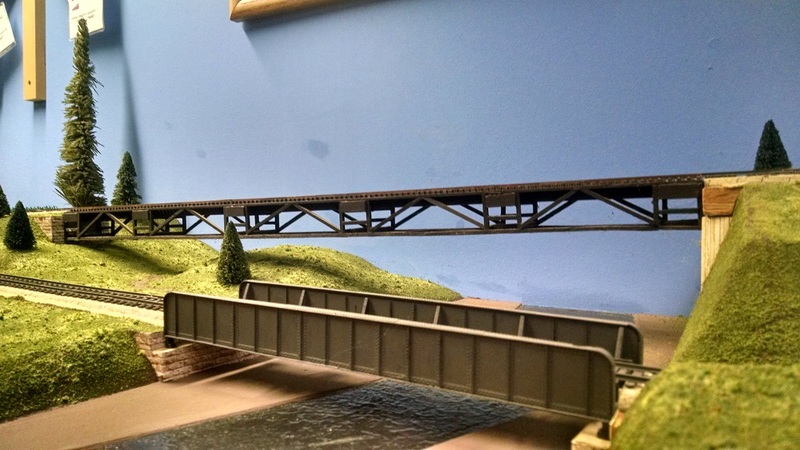 Another view of the bridge scratch built by Cliff Deveraux (background), on the Evergreen Hills and Allen Creek Railroad. When Cliff retired as Ticketmaster for the Chicago, North Shore Railroad in Mundelein, Illinois he and his wife moved to Waupaca, Wisconsin. There he met fellow model railroad enthusiast, Willard Wilde, and Mike Kirk. In 1964, as friends with a common interest, they decided to build a HO layout. They worked to clean out a storage room in the back of Willard Wilde’s garage. 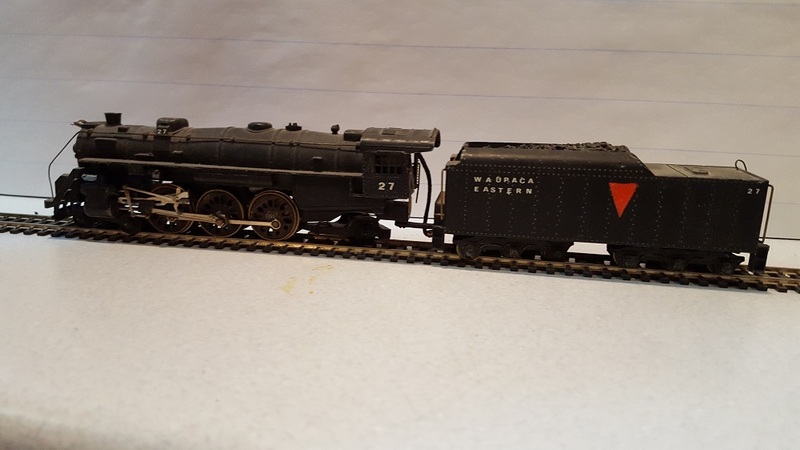 A furnace was added to accommodate the cold Wisconsin winters and these three members worked three evenings per week to construct the layout. 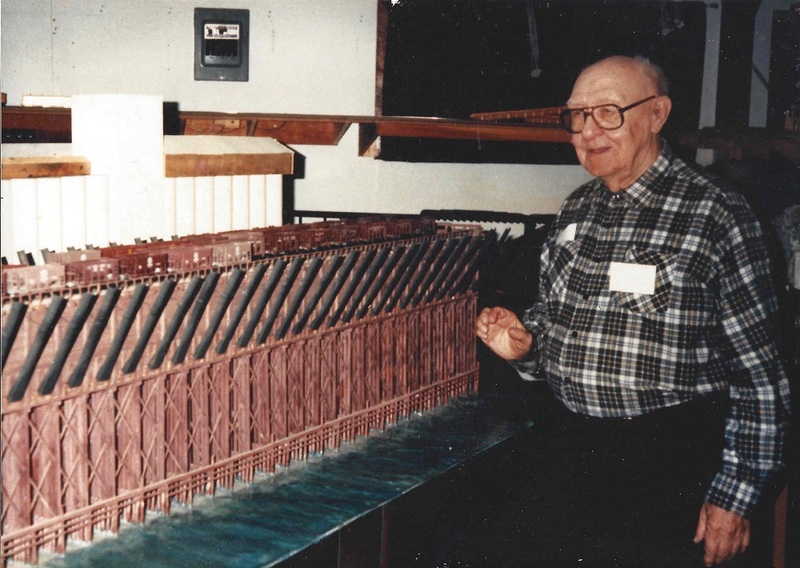 Cliff was a scratch builder, who made his own cars, bridges and the ore dock shown in his pictures. He built when fruits came in wooden crates. Using his Dremel table saw he cut this lumber into the sizes he needed for many of his projects. 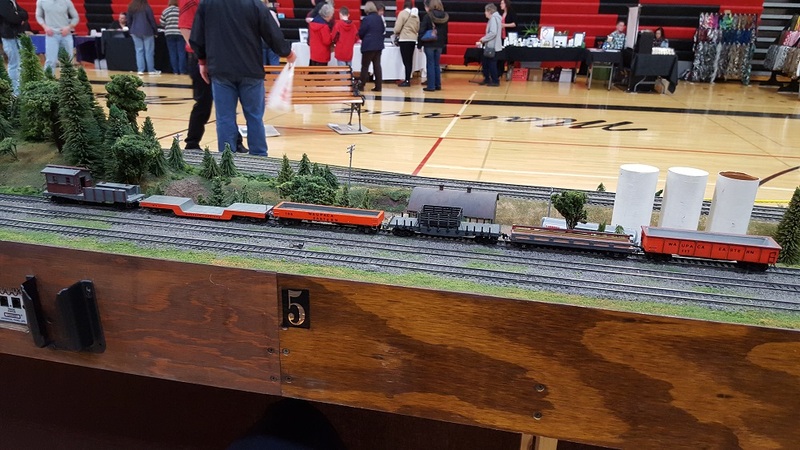 Cliff was always interested in getting young people involved in model railroading and long-time members who knew him have pieces of his Waupaca Eastern Railroad. 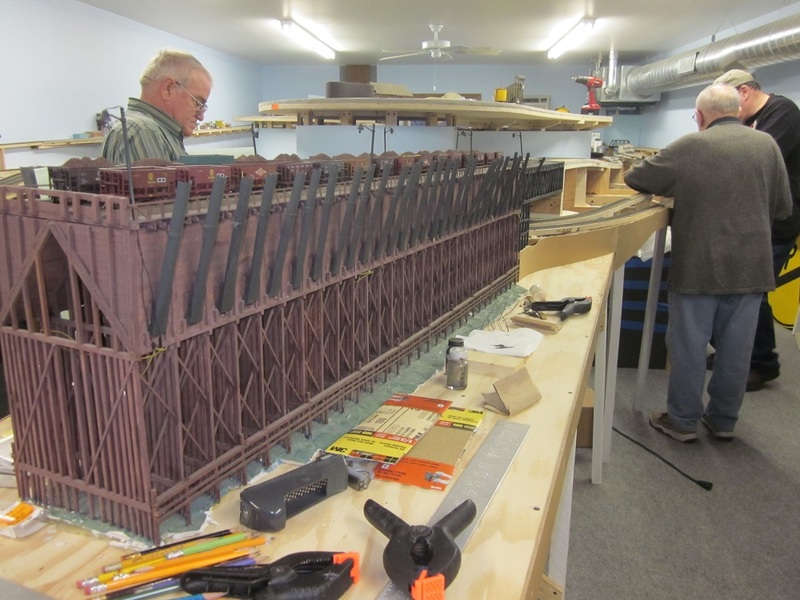 Cars show in the pictures that Cliff built are now in the collection of Dean Sauve, the bridge is on Roger Hildebrandt’s Evergreen Hills & Allen Creek layout, and the ore dock is part of Willard Wilde’s Lind Center & Southern layout.